I was losing the light fast and still didn’t have my picture for the 30 day challenge. I was tired and more than a little hungry. It would have been so easy to turn around and go back home. In fact, the little voice in my head was daring me, all the while assuring me that I had already done “good enough” for the day. I was soooooo tempted. Didn’t I deserve a break and maybe some chocolate? And then I saw that stupid little bird staring at me. 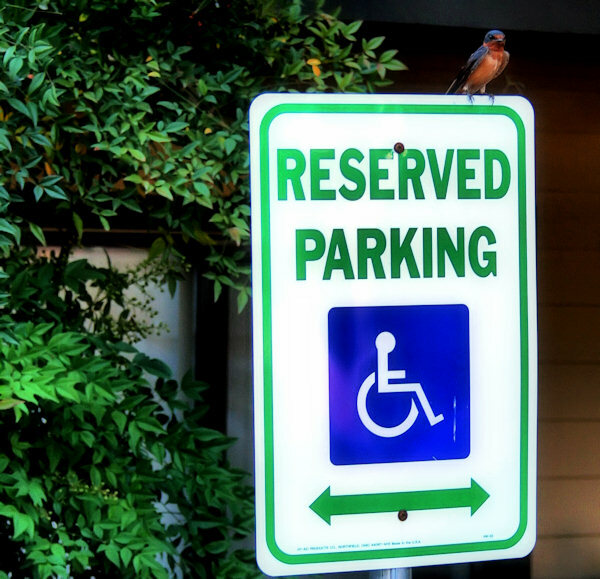 He was sitting on the reserved parking sign mocking me. It was as if he was telling me, to go ahead and go back home as long as I didn’t mind the fact that I would end up needing that parking spot if I didn’t keep focused on getting physically fit. I cranked up the tunes and kept on walking. I exceeded my goal today and that is more than good enough. oh he’s glorious … a beautiful sweet blue bird!!!!!!!! GREAT capture!!!! And 7.32 miles!!! That’s wonderful!!!! What an inspiration you are … in more ways than one!! !